The Venus brooch by Judy Onofrio radiates with a splash of color and a sense of humor. Reminiscent of fruit-topped headdresses seen in old movie musicals, the form is decorated with tiny found fragments–plastic beads suggesting oranges, white plastic pineapples, glass leaves, and a colorful halo of cast metal “fringe.” The base of the brooch includes a metallic fleur-de-lys, and imbedded among the trinkets above it is a small red figure of Venus. This brooch is an example of Onofrio’s sculptural style. A self-taught artist, Onofrio started her career in the early 1970s working with clay in her home studio. Decades later, her work reflects her love of materials and her changing interests, evidenced by her shift from outdoor art installation pieces to wood working and jewelry making. A leading mixed-media artist, Onofrio’s body of work includes sculpture, mosaics, jewelry, and beadwork. Her jewelry is influenced, in part, by her outdoor installations; creations in which she was inspired to build armatures onto which she layered beads, glass and other miscellany. A lifelong collector of beads, shells, and objects, Onofrio sorts and categorizes her finds for later use. Onofrio is driven by her interest in history and she portrays the passage of time through the relationships created by her placement of components. Many of her works tell stories through figurative or narrative design. Her work style is intuitive, creating narratives that mesh objects, shapes, and colors to form collages. In describing her work, Onofrio relates that she loves the relationships of materials, of collage—things that are more than they appear to be. Narrative by design, this brooch suggests a colorful life through its combination of humble yet eye catching components. The glittering costume jewelry elements provide a touch of bling. Costume jewelry became popular in the 20th century when plastics, resins, and glass were used to decorate non-precious metals or inexpensive metallic synthetics, which opened the jewelry market to a growing middle class. 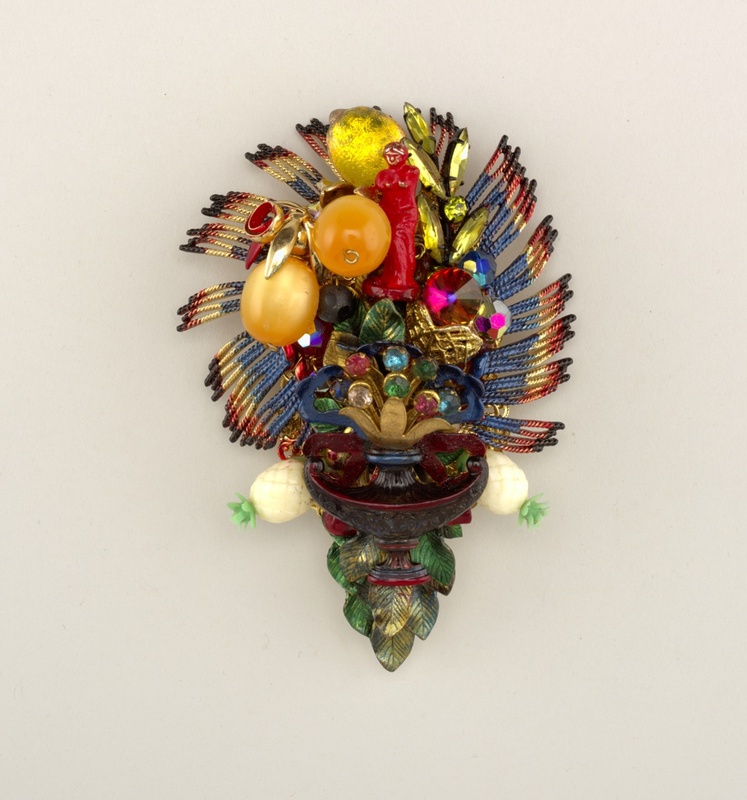 By the 1990s when this brooch was made, faux jewels were not only mass-produced, but employed by artists and designers who transformed costume jewelry into a contemporary art form. Karen Searle, “Wild Kingdom Judy Onofrio”, Ornament: 4 no. 2, (Winter 1990): 47 in Ornament as Art: Avant-Garde Jewelry from the Helen Williams Drutt Collection, the Museum of Fine Arts, Houston, ed. Cindi Strauss; Stuttgart, Germany: Arnoldsche Art Publishers in association with the Museum of Fine Arts, Houston, 2007.